I'll get to the charts in a moment, but first, the news everyone will be talking about is whatever comes out of the Fed's doublespeak today at Jackson Hole. Not that we've seen this movie before or anything. I am assuming they won't launch QE3 here, especially since they just extended Operation Friendly Game of Twister -- plus the market is near 4-year highs, which means my QE Flow Chart indicates that no new QE is coming right now. This chart has worked exceptionally well for over a year, and has completely eliminated the need for difficult analysis that involves actual research. Whether Ben's beard matched his tie and the two messages agreed, etc. The odds are good tomorrow will be volatile, since that's pretty much the norm when the Fed double speaks and the market tries to follow along with Ben's statements of "QE3 is coming! No it's not! Yes it is! Maybe! Ha!" Therefore, I want to start off with a big picture chart of the S&P 500 (SPX), since zooming-out often helps take the edge off volatile days. The market has been awfully sloppy since June, so I've spent some time looking for similar fractals to see if they help decode the recent rally. I found a fractal from 2008 which is extremely interesting due to the similarity not only in the shape of the waves, but in the actual price pivots. 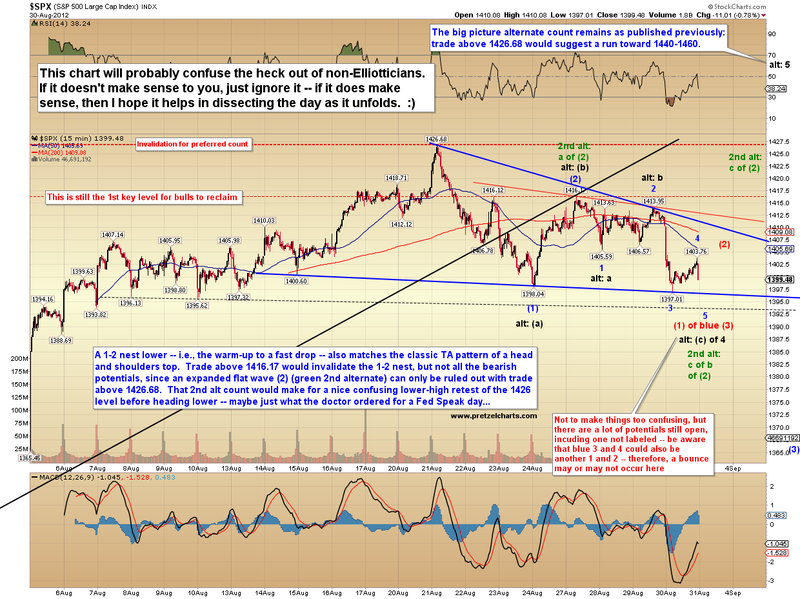 I've annotated the corresponding pivot levels from the recent rally. Next up is the 30-minute SPX chart. 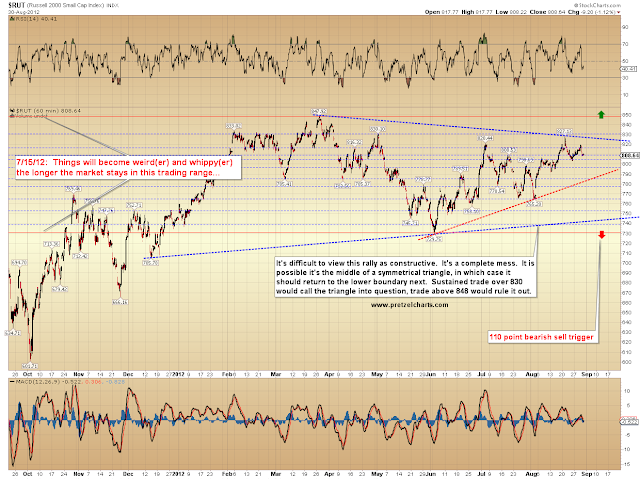 No material change here since the expected peak at 1426. 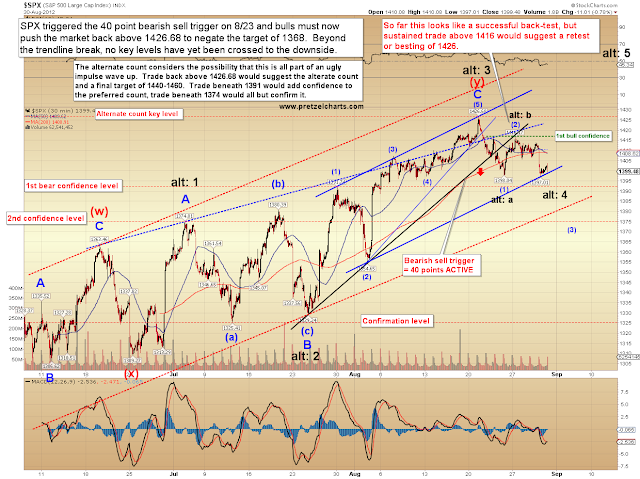 The alternate count does remain viable and bears should stay alert now, because if that count is active, it should be finding a bottom soon. The preferred count still believes it's more likely that the top is in, but there's been nothing in the way of confirmation yet. 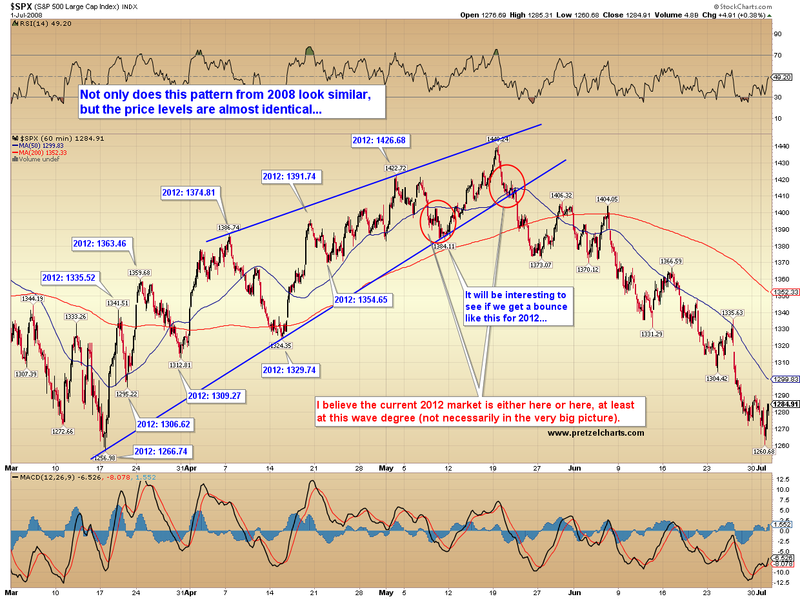 Next is the short-term SPX chart, which will probably confuse the heck out of non-Elliotticians. If you don't "get it," then just ignore it. 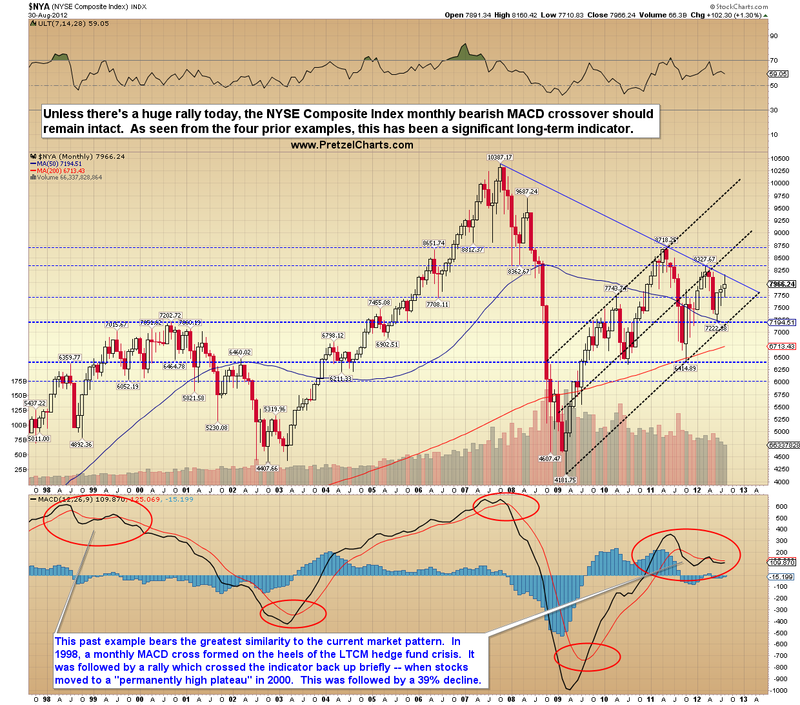 I also want to call attention to a couple other big picture charts: first up, the monthly NYSE Composite (NYA), which is a huge index that's pretty-well representative of the entire New York Stock Exchange. 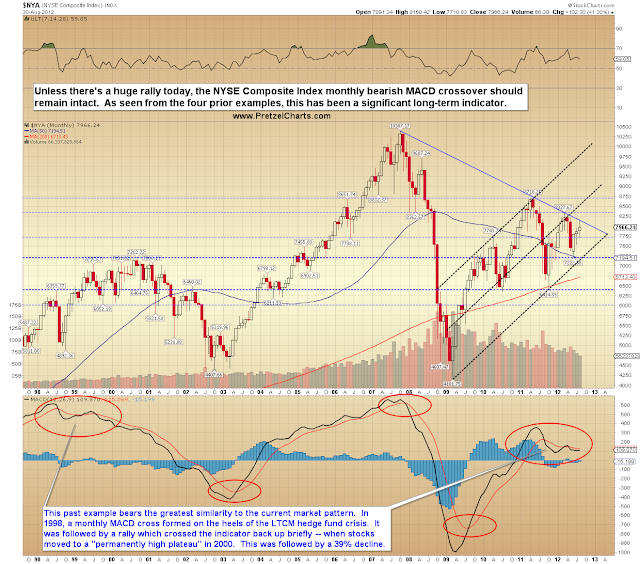 A few months ago, NYA formed a monthly MACD crossover, which I called attention to when it occurred. 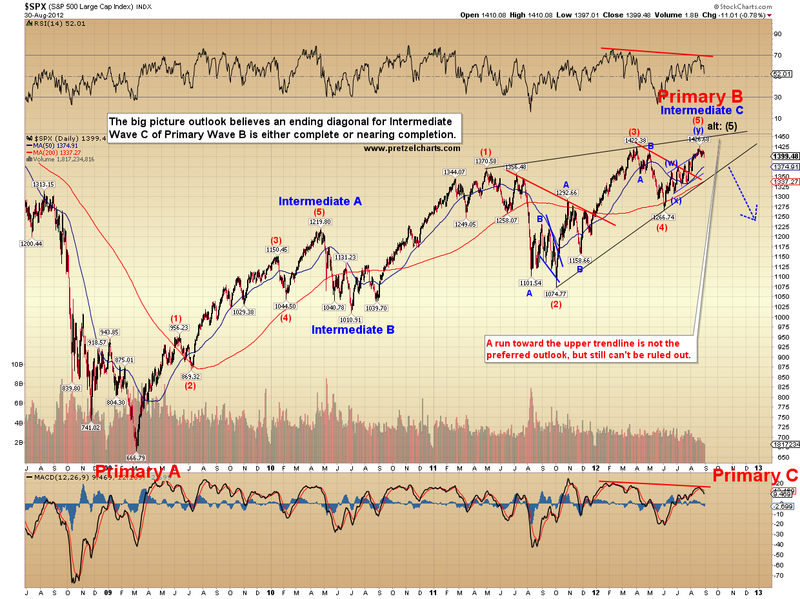 This long-term bearish signal hasn't been negated, and appears it will probably carry over into September. The Russell 2000 (RUT) has failed to make a new high with SPX. 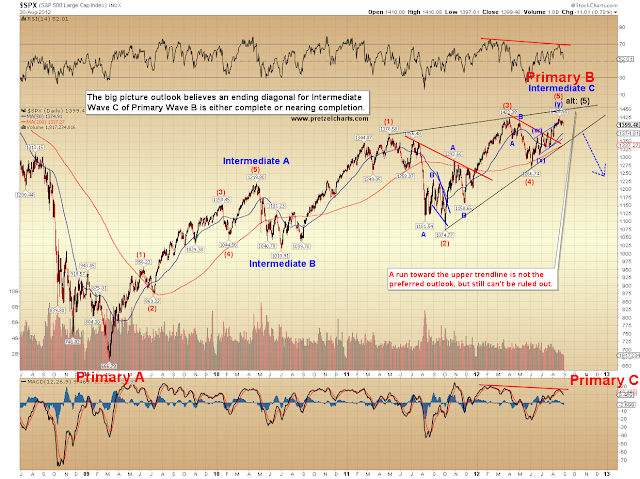 The chart really shows the sloppy corrective appearance of the recent rally -- the "weirder and whippier" comment of July 15 has proved accurate. 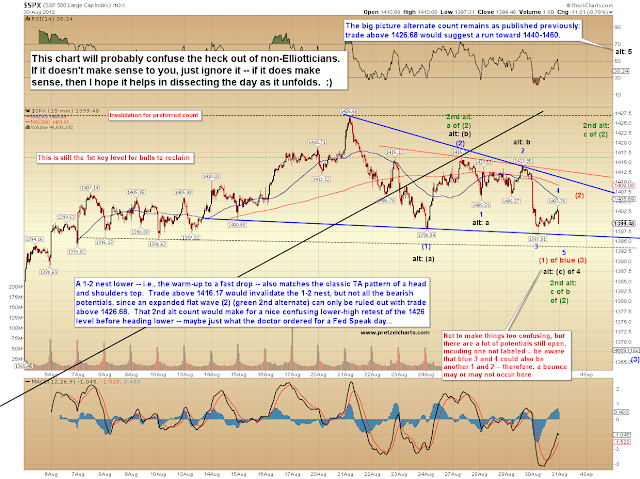 In conclusion, tomorrow could be a make-or-break day for one of the potential wave counts. 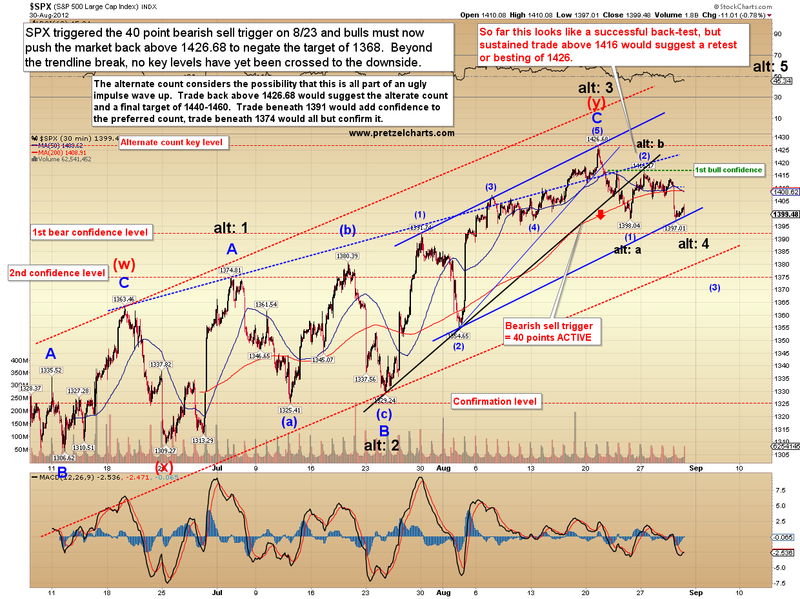 Bears should remain somewhat cautious at this point, because if the more bullish alternate count is going to play out, the market could begin a decent rally from here -- so I'm putting out the alert that if my preferred view is wrong, the market is now in the zone where it's finally likely to bounce. One potential warning sign (not shown) was that VIX closed outside its upper Bollinger Band on Thursday, and this often leads to at least a short-term rally in equities. If the preferred count is correct, however, then the 1426 high could still be subject to a retest, but will continue to hold for the foreseeable future, and the decline should start picking up steam once 1391 is broken. The short-term will probably hinge on the strength of the Fed's doublespeak today. Trade safe. Thanks PL. That flow chart is outstanding. I wonder if you'd be interested in doing a stand-up comedy routine with me some day? I think you've got the potential to not only survive but 'thrive' in the whacky world of bizarre humor that I live in half the time. Have a great weekend partner and don't forget who's on your side in that other topic that has your focus... EVERYBODY.